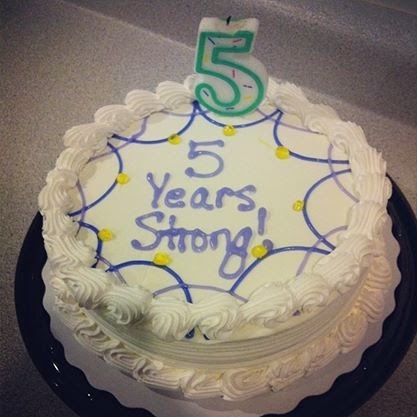 Last week I celebrated my five years of living with type 1 diabetes. It was a great celebration of life, as I was surprised to come home to balloons, streamers, dancing and singing (thanks roommates) as well as an ice cream cake that said, 'Five Years Strong' written on it. Vince even went as far as printing the nutrition information of the ice cream cake, after all I'm not the only one with diabetes living in the apartment either. It is hard to imagine what life would have been like had I not been diagnosed with type 1 diabetes five years ago. I was such a different person then and for some reason it is hard to imagine what life was like pre-diabetes despite it only truly being five years ago. I have found so much inspiration from my diagnosis that is it is hard to imagine who I'd know, where I would have travelled, what I would know had I not been diagnosed. I feel like my life would be in such a different place at this moment had it never happened. Of course the past five years have no been all balloons, cake and streamers. It has been tough. I have pricked myself god knows how many times and I have felt the pain of diabetes that is very much internal. It isn't easy and even when you feel like you have it under control, the numbers often reflect different. I hope that in my lifetime managing life with diabetes evolves as it has so much with technology. I am all for smaller pumps, smaller meters, and better quality of life. So here is to many more healthy years of living with type 1 diabetes. I hope to share my story with many, and make a difference in the diabetes community and beyond.